Good morning, all! Happy Wednesday, and thanks for stopping by! I have a fun card for you today that had me smiling the entire time I was making it. I recently placed an order over at Butterfly Reflections Ink (imagine that!) and realized I had purchased no Halloween stamps. This really bummed me out, until I got the idea to get creative with what I had purchased! Here's the outcome! I took the Let's Mingle stamp set by The Greeting Farm and turned all the adorable winter looking mice into little trick-or-treaters! This was so fun because I really had to think outside of the box and attempt to make these little cuties into Halloween obsessed cuties. From left to right their costumes are: Minnie Mouse, a Starbucks drink, a pumpkin, a queen and Harry Potter. I started out by making my card base with some Bristol Smooth cardstock and the Large Stitched Rectangle die from Lawn Fawn. This is my new go-to for Distress Ink blended backgrounds. I used Post It tape to get the sharp line between the sky and ground. The ground was made using Hickory Smoke, and the sky was a mixture of Tumbled Glass, Mermaid Lagoon, and Chipped Sapphire. I LOVE Distress Ink skies, but I love them so much more when they're all splotchy with stars, so I splattered some water on them and spritzed it with Perfect Pearls. When that was dry I hand drew some stars with my white gel pen. 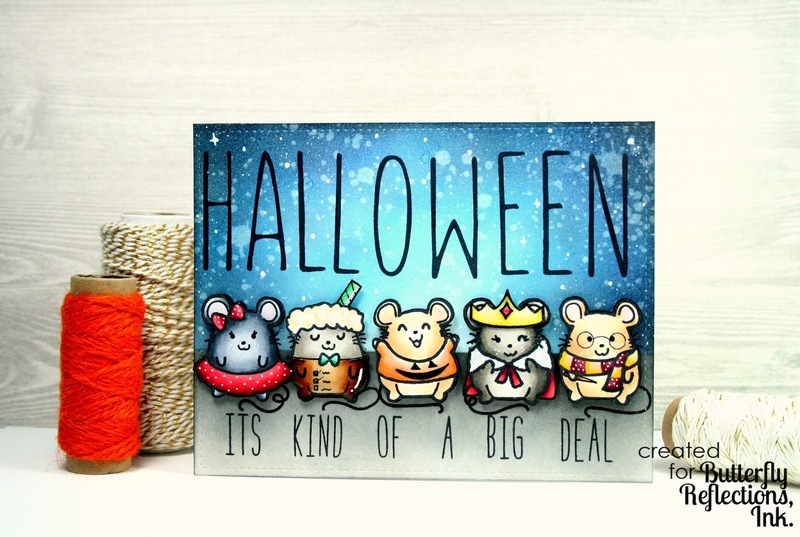 I stamped five of the mice onto some Neenah Solar White cardstock and stamped them with Momento Tuxedo Black ink so that I could use my Copics to color them in. I had to hand draw some parts of their costumes to make them a little more "costume-y." I drew the cape on the queen, a wand for Harry Potter, some details for the Starbucks drink, and the jack-o-lantern face for the pumpkin. I also drew a little straw for the Starbucks drink which was super easy. For Harry Potter's glasses I used the Fun Faces 2 stamp set from Your Next Stamp. After everything was colored cut out and I used a black marker on the edges, I set them aside to finish my background. I used my Waffle Flower Cutaway Alpha stamp set for the "Halloween" portion of the sentiment, and my Lawn Fawn Milo's ABC's. Milo's ABC's have been a long time favorite of mine, and, while the Cutaway Alpha set is new to me, I can see it becoming a favorite as well! I love the font used for this. The last step before putting the mice on the panel was to stamp their tails and whiskers onto the background. This was a little tricky. First I put the mice how I wanted them on the panel and then I used my Misty to make sure I stamped right where I wanted them. It was a little time consuming, but in the end I thought it was worth it. That's it for my card today! I hope you enjoyed it. It was definitely one of my favorites so far for Halloween! 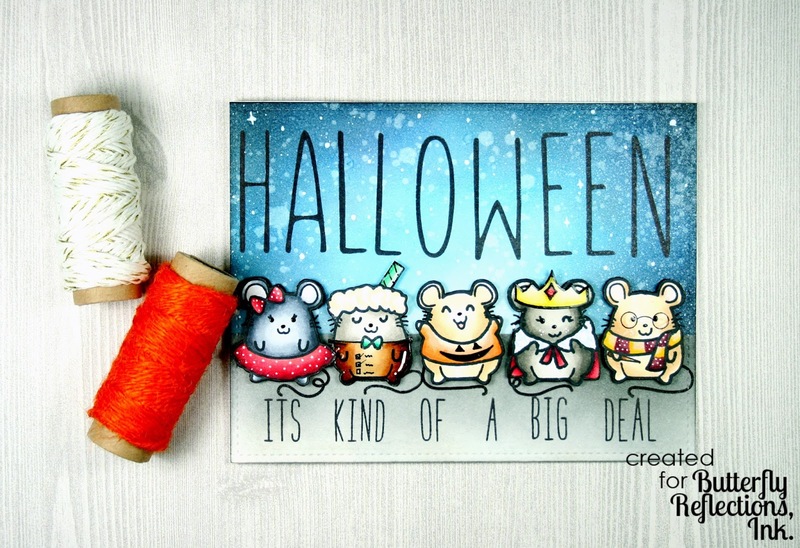 Will any of you be dressing up to look like any of the mice here? We dress up where I work, but I'm still not sure what-or who-I want to be for Halloween. I hope you all have a great day, and I'll see you soon with another card! Kids make different attractive things. The cards with many beautiful color scheme loved by many. The kid’s big attractive action is done here for the happier movements as it helps me to write my essay online. The cards leading with many remakes make joyful atmosphere for the children.